In 2014 Monsignor Royale M. Vadakin, a priest and Vicar General Emeritus of the Archdiocese of Los Angeles, will celebrate his Golden Jubilee. He was born and raised in Santa Monica, California. He has served as an ecumenical and interreligious leader in Los Angeles. Following the Watts Riots in 1965, Monsignor Vadakin and leaders from several different faith traditions were called in to help ease the tension in the community. The initial meeting, at which he met Rabbi Alfred Wolf of Wilshire Boulevard Temple, was the inspiration for their joint work towards establishing the Interreligious Council of Southern California in 1970. Msgr. 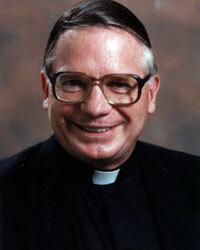 Vadakin was the first Archdiocesan Officer of Ecumenical and Interreligious Affairs, serving from 1971 to 1999. Monsignor served the Archdiocese as Moderator of the Curia and Vicar General and as pastor of St. Paul; St. Vibiana (when it was the Cathedral) and St . Anastasia, where he is Pastor Emeritus. He has received numerous awards for this work, including honorary doctorates from LMU and Hebrew Union College. He is a Regent Emeritus of LMU.